This bowl was used for sprinkling a fine powder, called 'pounce', onto early unglazed paper before writing. The pounce was shaken through the small holes in the copper fitting in the bottom of the bowl, and was then rubbed into the paper to stop the ink spreading, and the writing becoming blurred. Pounce was made from sandarac, the resin of a tree native to North West Africa. After writing paper was improved in the late 1700s, pounce pots were used to shake powdered chalk onto paper after writing to soak up excess ink, and to stop the ink smudging. Pounce pots were used until blotting paper came into widespread use in about the 1840s. 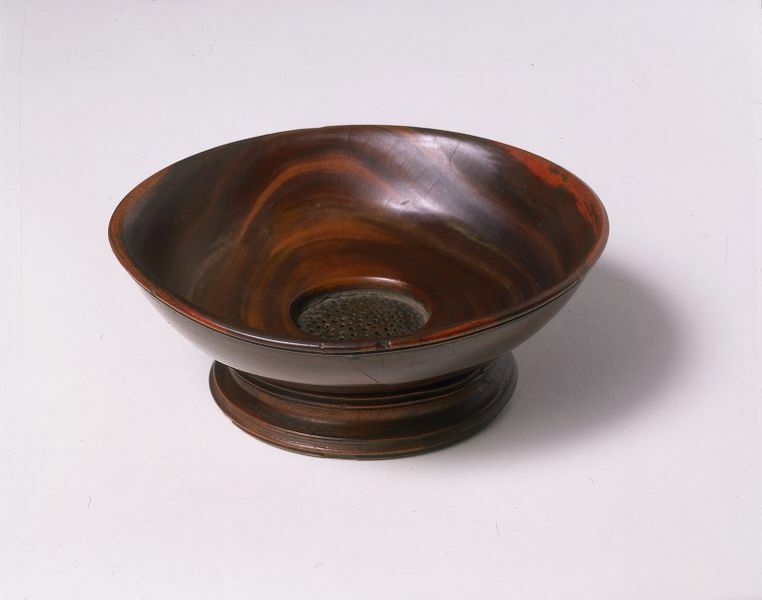 The bowl is made of lignum vitae, a hard, smooth wood imported from the West Indies, which has been shaped by being turned on a lathe. The foot of the bowl is a separate piece, screwed onto the bowl. The bottom of the bowl has a copper fitting pierced with small holes. 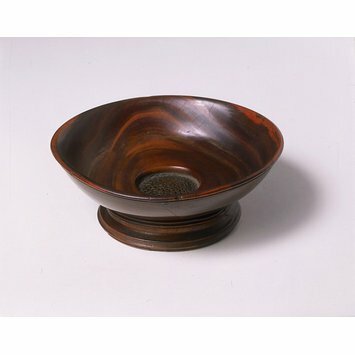 Turned lignum vitae wooden bowl, shallow, with a hollow foot screwed into the base of the bowl. Turned lignum vitae bowl, probably a pounce pot. English, ca. 17th century.